Delicate antiques and fine art pieces have always been a problem to relocate safely. For starters they are fragile and don’t really tolerate transit from A to B in the best of conditions, let alone rough treatment. Next, comes the problem of value as most of these items are literally priceless, whether sentimental or purely material their value is high, and many of them are also irreplaceable. So when it comes to relocating such items, you need someone who knows what they are doing. 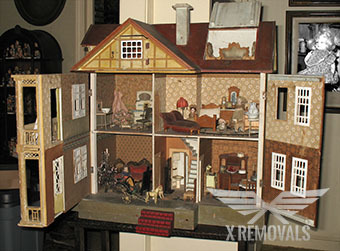 At X Removals we definitely known our stuff, and maintain a specialised antique and fine art removal service in London which will give you the necessary assurance and much needed peace of mind. All aspects concerning the safe handling and transportation of such precious valuables is done by specially trained and qualified technicians as we aim to minimise the risk of any mishaps at all stages of the process. Packing and securing of such items will be done carefully and meticulously, our guys will ensure that the given piece is protected from all sides, and that packing will withstand any accidental bumps, although our removal teams and crews will try to avoid such occurrences at all cost. Utmost care and precision will be taken when handling and shifting such items to and from our removal vehicles so that the pieces itself and the property around it remain undamaged. Be advised that packing, securing and safe removal of antiques and art London may take longer than shifting regular items, as this is a tricky, high responsibility process please bear with us for the time being as we need to avoid any errors along the way. As always, you can call us out for a preliminary job viewing so that we know how to better organise and conduct the relocation of your high value antiques and artwork. London has always been one of the cultural and art capitals of the world. The mainstream and alternative museums and galleries across the city are frequented by people from near and far. Whether it be classical artworks or contemporary and futuristic, the city’s art scene has it all. The antique business is also well developed, with priceless historic items having gone under the hammer (not literally) at many of London’s famous auction houses.